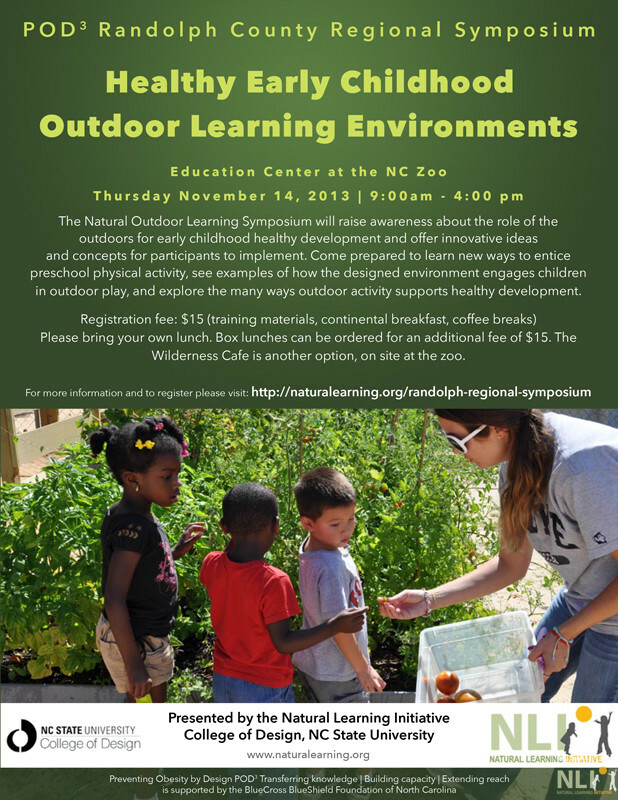 The Natural Learning Initiative at College of Design, NC State University offered a one-day symposium, Healthy Early Childhood Outdoor Learning Environments, to early childhood professionals within and close to Randolph County. The Symposium was held November 14th at the NC Zoo in Asheboro, NC. We explored ideas on how to design, plan, and manage the outdoor environment for early childhood through plenary presentations and hands-on sessions. Taking advantage of the resources available at the NC Zoo, participants discovered new approaches to using the natural environment to engage children in learning and discovery, while at the same time promoting healthy activity and nutrition. Robin Moore, Director, NLI and Linda Kinney, NC Zoo. Welcome & Introductions. Nilda Cosco, Director of Programs, NLI. The Benefits of Connecting Children to Nature. Robin Moore, NLI. Design for Nature Play and Learning. Rich Rairigh, Be Active Kids; Ronda Hawkins, Sandhills Community College. NC Play Programs: Play Daze & Play Mobile. Linda Kinney, NC Zoo. Introduction to NC Zoo Playful Pedagogy. Linda Kinney and Heidi Faris, NC Zoo. Orientation to KidZone play stations. Nilda Cosco, Director of Programs, NLI. Wrap-­up discussion.